Valentine’s Day is coming and I was trying to think up a cute handmade valentine card idea for my daughter to give to my husband. She’s only one so she can’t exactly do arts and crafts just yet. 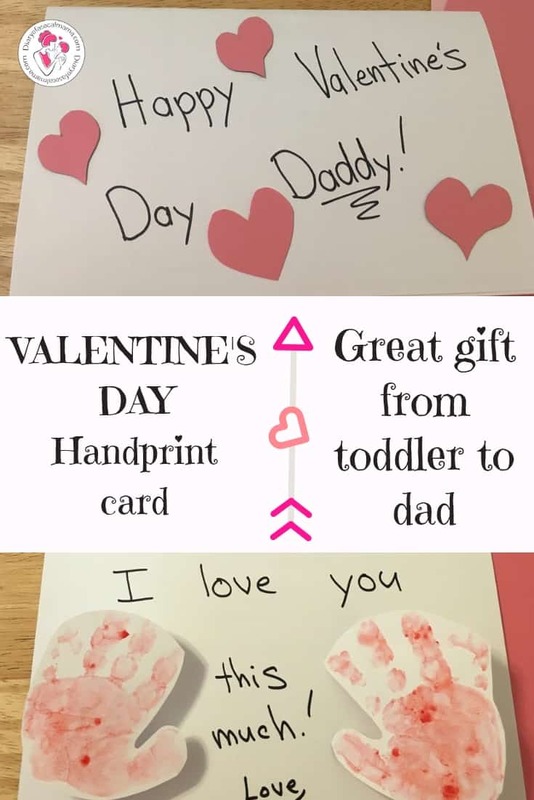 So I came up with this fun idea to make a Valentine’s Day handprint craft & card from her to daddy. This makes a great card for Father’s Day too! Check out the directions below. Post contains affiliate links. If you make a purchase after clicking one of these links I may make a commission at no additional cost to you. Optional – Valentine’s Day stickers, markers, & sharpies for decorating. The first thing you need to do is prep your paint. If you’re using regular paint that’s easy. If you’re making your own you will need to make it and allow it to cool before use. I put my daughter in her high chair for this part to contain her as she’s only one. Apply a thin even coat of paint to your child’s hand and press firmly onto the cardstock. Wait a few seconds and then try to lift the hand straight off as much as possible. Repeat with the other hand. Repeat until you have all the handprints you desire. (These cards make great gifts for grandparents as well! Having a few extra on hand is advised in case you make a mistake.) Hopefully, your child will be more cooperative than mine was! Once the handprints are dry, the time will vary greatly depending on what type of paint and how thickly it was applied. Cut the handprints out. I did not cut between each finger as my daughter’s hands are small. Now it’s time to design your card! Check out two examples above and then let your imagination run wild! If you have older kids you can set them loose with stickers to fill in the white space on their card. If you want to make my “I love you this much card” follow the directions below. “I love you this much” card. If you want to make the “I love you this much card below” simply fold a piece of cardstock in half. Next, cut two strips of cardstock about 3/4 of an inch wide, thicker if you have larger handprints to work with. Take the strips and fold them accordion style. I found about 5-7 folds to be sufficient. Cut off any excess. Tape or glue one end of the accordion to the back of each handprint and tape the other end to the card. Now your card will have a bit of a 3D effect. Have your children present their card to Dad on Valentine’s Day and watch him light up! For more great gift ideas for your husband check out my 14 day love challenge. 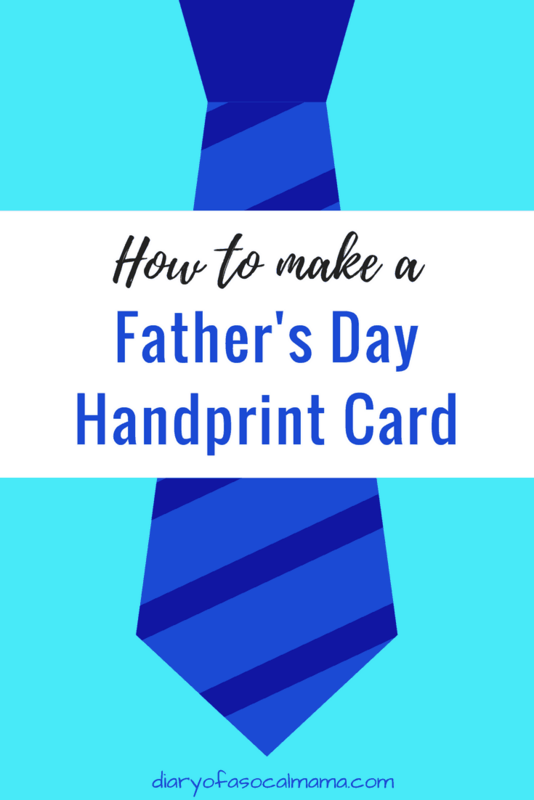 Making a Father’s Day card instead? 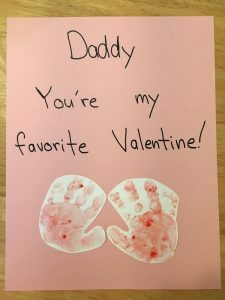 Use Dad’s favorite color for the handprints and change up the cover. You can add some of these fun Father’s Day stickers if your child is too young to do much drawing/decorating of their own. Pro Tip: If you’re doing most of the work don’t try to make it look perfect. This is supposed to be a gift from your baby or toddler to dad so it should look somewhat childish! I’d love to see what you come up with! Tag me on Instagram @diaryofasocalmama or leave a “Tried it” photo comment on Pinterest!